Physical therapist Ingrid Peele coaches Kim Brown through strengthening exercises to help her with her chronic pain, at the OSF Central Illinois Pain Center in Peoria. At the OSF Central Illinois Pain Center in Peoria, Kim Brown participated in a multidisciplinary treatment program that included cognitive behavioral therapy with psychologist Lisa McClure, who helped Brown address the psychological issues that can accompany pain. It took several months and a team of half a dozen doctors, nurses and therapists to help Kim Brown taper off the opioid painkillers she'd been on for two years. Brown, 57, had been taking the pills since a back injury in 2010. It wasn't until she met Dr. Dennis McManus, a neurologist who specializes in managing pain without drugs, that she learned she had some control over her pain. "That's when life changed," she said. 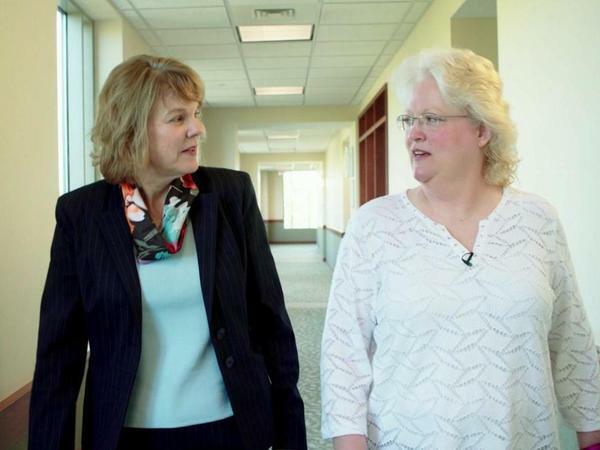 During a 12-week series of appointments at McManus' clinic in Peoria, Ill., Brown learned new ways to prevent and cope with pain, as she gradually reduced her opioid doses. Roughly a third of Americans live with chronic pain, and many of them become dependent on opioids prescribed to treat it. But there's a growing consensus among pain specialists that a low-tech approach focused on lifestyle changes can be more effective. This kind of treatment can be more expensive — and less convenient — than a bottle of pills. But pain experts say it can save money over the long term by helping patients get off addictive medications and improving their quality of life. "It's important to remember that the main treatments that are recommended for these pain conditions are not medication treatments," said Dr. Erin Krebs, a primary care physician and researcher at the Minneapolis VA Health Care System. Recently, Krebs published the first long-term randomized trial of opioids for treating chronic back pain and arthritis, and found that opioids are no better than nonopioid medications. She said drugs of any kind are the lesser choice for the vast majority of patients. The gold standard for treatment, she said, is a combination of things like exercise, rehabilitation therapies, yoga and cognitive behavioral therapies. This approach is consistent with the most recent guidelines from the Centers for Disease Control and Prevention for prescribing opioids for chronic pain. But it's still uncommon. Brown's painkiller use started after she blew out a disk in her back. "It was the simplest thing," Brown said. "I picked up a bag of garbage with my right hand, and I immediately knew something was wrong." She was put on opioids, like so many others who see the doctor about pain. In a single year, health care providers write enough opioid prescriptions for every adult in the U.S. to have a bottle of pills. Each time Brown came back, still in pain, another opioid was added to the list. She was eventually taking four different drugs — Percocet, Vicodin, morphine and Dilaudid — popping pills every two hours. "I was just drugged constantly," Brown said. "And even with that, it didn't take care of the pain." Not only did the drugs not help with the pain, the side effects made it worse. Brown had such severe abdominal pain from constipation she could hardly walk. "It kills your life. It totally robs you of every aspect," she said. "I couldn't do anything because of the pain. But I couldn't do anything because of the pain meds. And I couldn't talk to anyone about it, because it was so embarrassing." Brown tried to quit on her own. But after nine days of nausea and fainting from withdrawal, she was back on the medications. "I finally went to my family doctor and said, 'I need help, I've got to get off this stuff. I can't live like this anymore,' " she said. That's when she was referred to McManus, director of the OSF Central Illinois Pain Center in Peoria. He specializes in helping chronic pain sufferers like Brown get off opioids. "From my perspective, if you stabilize the dose and slowly taper off, these patients do remarkably well," he said. At the center, a team of providers works together to help patients make lifestyle changes that reduce pain during everyday activities. The approach includes a combination of physical and occupational therapy, massage and nutrition counseling. Patients also participate in cognitive behavioral therapy to address the psychological issues that often accompany pain — such as overcoming fears of letting go of medications they've become dependent on. A nurse coordinator oversees all the moving parts and does follow-up assessments after the program is completed. 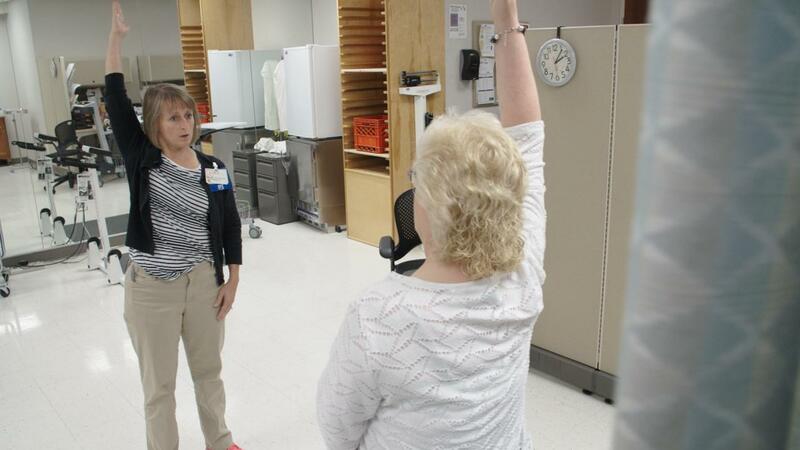 At the clinic, Brown met occupational therapist Gabe Stickling, who taught her things like how to properly lift heavy objects and how to safely keep exercising even when she feels a twinge of pain. Stickling said people with chronic pain often avoid physical activity "because they're afraid they're going to injure themselves or damage their bodies." But inactivity can make the pain worse. McManus said some of his chronic pain patients can taper off opioids with a less intensive treatment. But for some of his patients, the multidisciplinary program is most effective — if they're willing to commit to making change. "Most people just really want to have the magic wand that will get them all better," he said. "And I'm just trying to say, I don't have a magic wand but I might have a way out of this jungle that you're in." And because pain treatments that don't rely on drugs are hands-on and time-intensive, it can be hard to find a clinic that offers them — and to get insurance to cover them. This wasn't always the case. Until the 1980s, the multidisciplinary approach was the go-to treatment for chronic pain, according to a 2016 review on the history of chronic pain management. Its popularity declined as reimbursement rates went down and hospitals began to emphasize more lucrative procedures. Gradually, opioid treatment became the predominant strategy for pain treatment strategy. Today, McManus said his practice spends a lot of time fighting to get the treatments covered. "The pain program is not considered to be worthy of the price," McManus said. Costs vary but run to several thousand dollars for a program like the one Kim Brown went through. "If you compare a fairly intensive multidisciplinary program to surgery and to drugs, the cost is not high," said Steven Kamper, a public health researcher at the University of Sydney in Australia. He's co-author of a 2014 meta-analysis that found modest benefits for multidisciplinary treatment programs for chronic low back pain. Kamper said, the costs are reasonable especially if you consider the long-term effects of living in pain. Many chronic pain sufferers are unable to work and become eligible for disability insurance. "The big costs of chronic pain are in productivity losses," Kamper said. Krebs is hopeful non-drug therapies will regain popularity, as communities recognize the hidden costs of opioids. "It's not just the price of the pills," she said. "It's also the price of the consequences when you over-rely on something." Krebs and Kamper agree more research into pain treatment is needed. But when choosing between an addictive medication with no evidence of benefit, and low-tech therapies with some evidence of benefits, McManus said the choice is clear. "I did take an oath: First do no harm," McManus said. "As a pain physician, I have a responsibility to use evidence-based medicine to manage my patients that have chronic pain." Brown is thankful that the multidisciplinary approach helped her taper off opioids and get her life back, even though it's a different life than before her injury. "There's no such thing as a pain-free day for me," Brown said. "It never, never fully goes away." She has just learned how to manage life with it. This story was produced by Side Effects Public Media, a news collaborative covering public health. You can follow Christine Herman on Twitter: @CTHerman.